Meeting of mixed race business team at loft office. 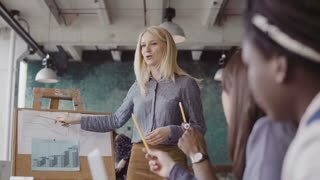 Woman manager presenting financial data, group of people clapping. Meeting of mixed race business team. 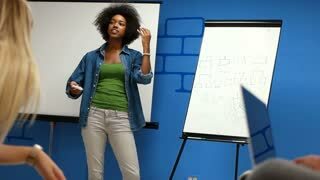 Woman manager presenting financial data to group of people at modern office. Female manager comes to business team. Mixed race group of people meeting in modern office. Camera moves up from legs.